In a large cup add blueberries, sugar, mint leaves and lime wedge. Muddle the ingredients and discard the lime wedge. Pour into a separate cup and top with crushed ice and ginger ale. Optional: Serve with lime slices. In a large pot of boiling salted water, cook pasta according to package instructions; drain well. In a medium saucepan, combine butter, garlic and red pepper flakes over medium heat until the butter has melted. Cook, whisking constantly, until the foam subsides and the butter begins to turn a golden brown, about 4-5 minutes, skimming foam as necessary. Remove from heat. Stir in pasta and Parmesan until well combined, about 2 minutes; season with salt and pepper, to taste. Combine oil, vinegar, fennel seeds, and mustard in a small jar with a tight-fitting lid. Season with salt and pepper. Shake to combine. 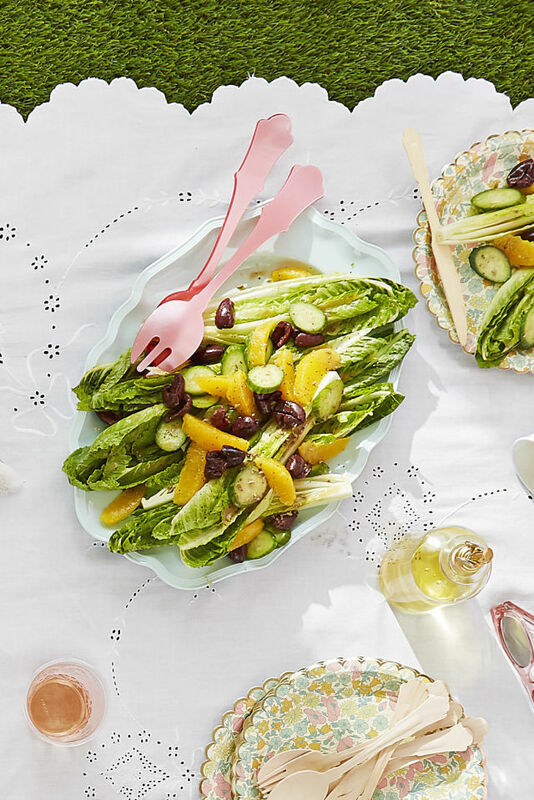 Arrange romaine in a 13-by-9-inch dish. Top with cucumbers, oranges, optional sliced fennel, and olives. Cover and chill up to 1 day. Just before serving, drizzle with vinaigrette. Season with salt and pepper. -To a large bowl, add the chicken drumettes/wings, and pat them dry with a paper towel. -Add to them ½ teaspoon of the salt, ¼ teaspoon of the black pepper, the paprika, garam masala, turmeric, coriander, cumin, and cayenne, and using your hands, mix/rub the spices into the chicken; set aside for a moment. -In a small bowl, combine the yogurt, lemon juice, garlic, ginger, and sriracha, and mix to blend; pour this mixture over the chicken, rubbing it into the chicken, and allow it to marinate for at least 2 hours, up to overnight. -When ready to bake, preheat your oven to 450°; line a baking sheet with foil, and place a wire rack over the baking sheet. -Remove the chicken from the yogurt marinade, and allow the excess to drip off; place the wings onto the wire rack, and bake in the oven for about 25 minutes, until slightly charred and crisp. -Serve garnished with a some cilantro leaves, and the Cool Minted Yogurt Dipping Sauce on the side. -Add all of the ingredients up to and including the mint to a small bowl, and add in a couple of good pinches or salt (however much you desire for flavor); mix with a fork, and use immediately, or keep covered and in the fridge until ready to use. Finely chop mint leaves. Then, in a small bowl, whisk together mint, kefir, honey, avocado oil. In a large bowl, combine mixed greens, blueberries, and cooked kamut. Toss with 1/2 cup of the mint yogurt dressing. Top with sliced almonds and serve immediately. Cut the cucumber in half diagonally and peel thin strips of skin off of each half. Cut each piece of cucumber in half, lengthwise. Remove seeds. Slice the cucumber into 1/4 inch pieces and set aside. Peel the carrot and cut into thirds. With a small, thin knife cut narrow lengthwise grooves in the carrot to make a floret shape (about 5 cuts if the carrot is thick, 4 if the carrot is very thin). Using a mandoline or sharp thin knife slice the carrot into florets. Peel ginger and finely grate, set aside 2 teaspoons. Mix 1/2 cup unseasoned rice vinegar with 1/4 cup sugar and 1/4 teaspoon salt until sugar and salt has dissolved. Add 2 teaspoons grated ginger. Combine cucumbers, carrots and vinegar mixture in medium size bowl. Cover and refrigerate for at least 1 hour. Cucumbers and carrots will become delightfully crispy when chilled. The pickles will keep well in the refrigerator for a couple of days. Rinse the blueberries. Add them to the bowl. Slice the cucumber(s) lengthwise. Use a spoon to scrape out the seeds. Slice them up and add them to the bowl. Combine the lemon juice, olive oil, and salt and pepper in a small bowl. Taste for seasoning, adjust as necessary. Add it to the bowl. Add the feta to the bowl. 1. Pick a few fennel fronds to make 1 tablespoon. In a bowl, whisk together the fennel fronds, parsley, salt, pepper, lemon juice, garlic and olive oil. Set aside. 2. Use the large holes of the box grater to grate the carrots. Use a mandoline to shave the fennel bulb (or slice very thinly with chef's knife). 3. Toss together the carrots, fennel bulb with the dressing. In a large bowl, combine squash, fennel, dill, olive oil, and lemon juice and toss to combine. Season with salt and pepper. Add goat cheese, gently toss, and serve right away. Combine the yogurt, honey, vanilla extract, and vanilla bean seeds in a bowl and set aside. Combine the orange juice and banana slices in a separate bowl. Add the berries and grapes and gently mix the fruit mixture together. Spoon the fruit into serving bowls and top with the yogurt. Preheat your oven to 400* F.
Peel and trim ends from carrots. Chop each carrot into 3-4 inch segments. Quarter the segments. If the ends of one or more of your carrots is very thin you may just want to halve it. Aim for fairly uniform pieces. Toss with oil and salt + pepper and spread in an even layer on a baking sheet. Roast for 20 minutes, then flip and roast for another 10-20 minutes until golden brown and tender with crisp edges [time will depend on thickness]. While roasting the carrots heat a small pan with 1 teaspoon of oil over medium-low/low heat. Once hot place the garlic in the pan and stir constantly for about 3-5 minutes until light brown in color. If it starts turning brown right away the pan is too hot. Place the garlic on a doubled over paper towel on top of a plate to drain the oil. Let cool. Mix half of the garlic with the ketchup, basil, and a big pinch of black pepper. Let sit in the fridge while carrots finish roasting. Toss carrots with remaining garlic and place in the oven for 1 more minute [no longer or it will burn]. Remove from the oven and serve with ketchup. notes: The garlic addition is optional but tasty. Highly recommend at least adding it to the ketchup. Heat oven to 350°F. Line an 8-inch square baking pan with 2 crisscrossed pieces of parchment, leaving an overhang on all sides. Combine the brown sugar, flour, baking powder, cinnamon, salt, and oats in a large bowl. Stir in the melted butter and mix until the pieces form a coarse crumble. Spoon 2 cups of the mixture into the bottom of the pan and gently press into an even layer; reserve the rest. Combine the maple syrup, yogurt and cornstarch in another bowl. Pour into the pan and spread into an even layer. Scatter with blueberries and top with remaining crumble. Bake for 45 minutes, until light golden brown. Remove from oven and let rest for 30 minutes, then transfer to the refrigerator to cool for 1 hour more. Slice into bars and serve. Bars will keep, refrigerated in an airtight container, for 3 days. Rinse chicken wings and pat dry. Remove tip and discard; separate each wing at the joint into 2 pieces. Place wings in a shallow dish and pour over the soy sauce, ginger, cilantro, garlic, and lemon juice. Toss well to coat; marinate, refrigerated, for 2 hours. Remove wings from marinade and pat dry; season with salt and pepper. In a large saute pan over medium-high heat, melt the butter in the olive oil. When the butter stops foaming, add the honey and chicken wings and fry until browned on each side, about 5 minutes. Continue cooking the wings, turning them over often to coat them as the glaze reduces. Cook until the wings are sticky and cooked through. Garnish with sesame seeds and serve.